As a wife and mother I am constantly battling the family on food choices. I want them to eat somewhat healthy and drink water and they don’t. So I’ve learned to pick my battles and HIDE the veggies in foods they like. Case in point, this week I was crunched on time and wanted to do something simple like pasta. Although I frequently us whole wheat pasta as a healthier option, when we do pasta night, it never comes with a side of veggies …….. Unless I hide them. 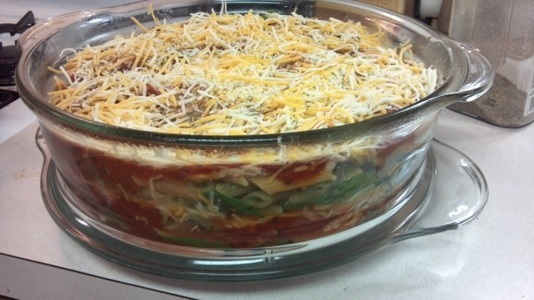 I boiled my garden veggie pasta al dente, then grabbed a baking dish and started layering. Stuffing in as many veggies as possible. Each time covering the veggies with a little sauce and cheese. Then bake til bubbly & everyone is happy. This was so easy and can be done with a variety of veggies but I used what I had on hand. Please feel free to change it up to suit your family! Garlic & Italian Seasoning to taste. I sprayed the baking dish with cooking spray and started layering: sauce, veggies, pasta, chicken, cheese, spices, sauce, repeat. Bake at 425 degrees until bubbly, which was about 35 minutes in my oven. Don’t be afraid to hide the veggies on your family too! I do it all the time and most of the time they don’t seem to mind too much although if I put spinach in Aby’s scrambled eggs one more time she may take over the cooking!. Good luck! 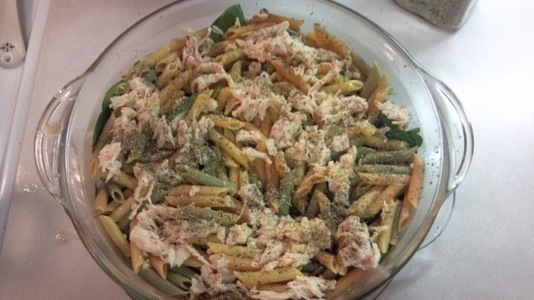 This entry was posted in Family, Healthy Eating and tagged Hiding veggies, putting veggies in a family friendly meal, quick healthy dinner by tootallfritz. Bookmark the permalink. When I was a kid I thought cheese was good for you because my grandma put it on every vegetable. That or HEAPS of butter! LOL. But we weren’t picky. That was just the way she cooked. How so very true… Lots of cheese and sauce can hide most things. Awesome…can ya come over and cook some for me? LOL! 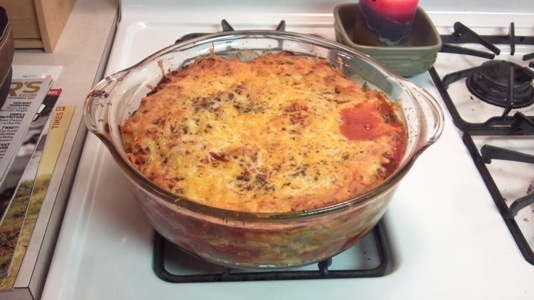 I love your recipe and it looks great….just use low-fat or I would use fat-free cheese….but that’s just my preference to keep the fat contribution low. If ya have to trick your hubby and kiddies into eating more veggies…then here’s my trick…just take spinach, broccoli…whatever veggie ya want and cook it down in the sauce. 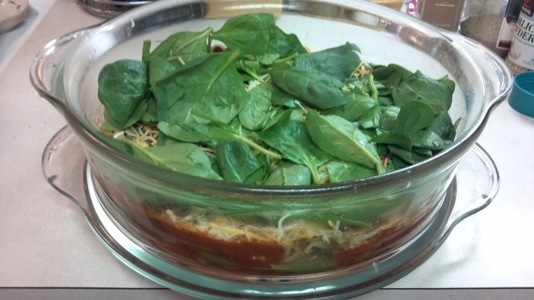 Making spaghetti or mostacolli….then simply make the sauce and cook down the raw veggies in them.. Spinach won’t look or be spinach anymore to the person that abhors the thought of eating spinach. And the smaller you cut up the pieces before you simmer it all down…the better…the less noticeable they are. Add the right compliment of spices…they will be eating high-veggie meals and not even recognizing it…and loving it to boot! Simmering is the key….low heat…breaks-down the cellular structure in plant fiber…but the good and healthy ingredients…just get incorporated into the sauce. Got to be careful with the cheese cause it can build in too much fat and cholesterol….unless you use it sparingly or go to the low-fat or fat-free versions….which work quite well in sauces that are simmered. That’s the way I think about it too. I agree that we both could be way off but I figure its worth a shot!